I went to my local video game store on Friday to pick up a copy of Animal Crossing: Happy Home Designer, and I walk out with an entire generation’s worth of Nintendo console goodness. Thanks, random game store guy. No, I didn’t get his name. I want to say Dave, but I want to say everyone is named Dave. He’d come to this particular establishment to trade in what he could of his older gaming collection. He’s been offered a job across the country at the last minute, and had to move in a hurry. Yeah, the thought that the stuff was stolen did briefly cross my mind, but the game store employees knew this guy, and what he could trade in was used towards the purchase of a New 3DS XL and a copy of Monster Hunter 4 Ultimate. At least I remembered that. What he couldn’t trade in is in a box in my living room, awaiting a crappy thrift store television so it can be set up in my children’s room to teach them about one of the best generations of Nintendo gaming. At first I thought he was trying to sell the contents of the box and I passed. I had to print out coupons to justify the Animal Crossing purchase. There was no way my wife wouldn’t kill me for adding a box of magic beans to the shopping list. But no. He just wanted to give his stuff a good home. We tried to convince him to take it with him, but he had no room and had already decided to get rid of the collection. We suggested he go to eBay, he countered he had no time. The game store employees would be fired for taking it. So I did. So what’s in the box? There are a couple PlayStation 2 and original Xbox games. He had Soul Calibur II—the one with the system-specific guest stars—for all three consoles. There’s also a random Beck CD, a Professor Layton title for 3DS, a couple of PC adventures and a PlayStation 2 network adapter setup disc. 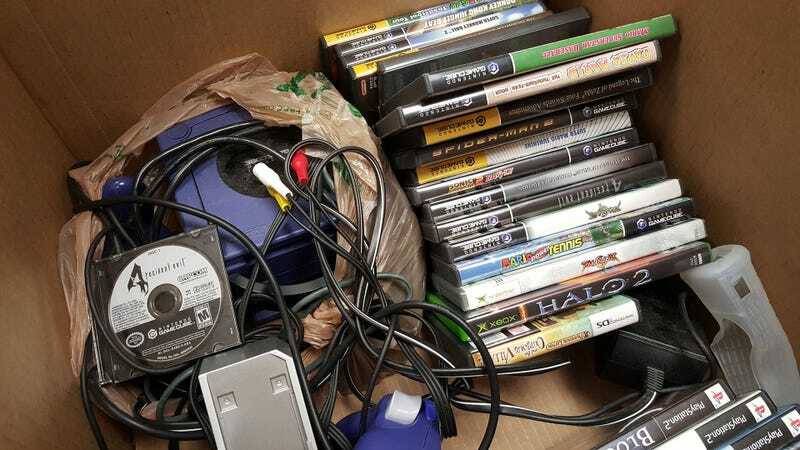 Judging by the dust on the console, it’s been a long time since these games got any love, and I’ve got a pair of young boys who have way too much to give. Seems like the perfect fit. I’ll have to explain discs to them—as far as they are concerned they are shiny things to throw. I’ll also need to reinforce their understanding of wired controllers, as they are prone to running down the hall excitedly grasping their tablets, USB cable and charger plug bouncing after them. But I’m up to the task, and look forward to introducing my children to one of Nintendo’s best generations. Plus I’ve never finished Super Mario Sunshine. I am a monster. So thanks again, random game store guy who might be but probably isn’t Dave. Your games are in good hands, or at least will go towards making memories that will last a lifetime before the kids accidentally blow it all up.